BOFFO is an arts and culture non-profit fostering collaborations between artists, designers, communities, and theorists to inform and engage the public in participatory arts programs. 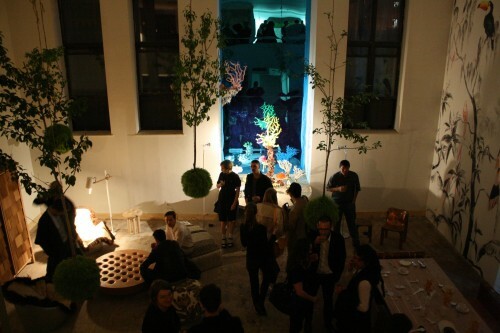 In late May, it launched a show house at a Lower East Side public school building turned apartment house, called The Madison Jackson. It turned out to be a clever draw getting people to a neighborhood that is lower and farther east than more popular sections of the LES. I speak from familiarity as I live in a perch overlooking the venue. The glam show house is unusual for a neighborhood comprised largely of public housing blocks next to tall towers that formerly were union cooperatives and as close to socialist housing as we’ve had in NYC. This large swath of housing allows for only a small number of storefronts or buildings that can easily convert to restaurants, retail, business, or other services and that means little ambient, walk-in traffic. And that makes BOFFO’s ambitious efforts all the more unusual. The Madison Jackson is developed by the Sung family with Michael Bolla of Douglas Elliman. The six-story building with 110 units, priced around $750 per square foot, is now being pitched to wealthy observant Jews, with added features including a 24-hour kosher and vegan food service and a pool with designated single-gender swimming hours. In this context, BOFFO was a welcome way to get a peek into this building that has been under start-and-stop construction for about 15 years, ever since PS 12, designed by Charles Snyder in 1908, held its last class. Artist/designer Andrew Yes curated four spaces in four ground-floor bi-level apartments around the themes of Nature, Future, Play, and Work. On entering, visitors were greeted with an interactive light installation, “Cloud” by Focus Lighting, which leads you down a corridor and links the four themed rooms. Infrared sensors process movement beneath 200 tubes and up-lighting on the ceiling, shifting color in 12 different configurations. In the Work room, a geometric jungle gym of green and chrome dominates the space. Actually, it’s a modular storage system by Ghiora Aharoni Design Studio for USM Modular Furniture that has been set on a reflective floor and outfitted with artist books by Printed Matter. Also featured in this room is the Clown lamp by Jaime Hayon switched on by touching the gold-dot “nose” on a head-shaped white ceramic base. The Play apartment is dominated by Tom Fruin’s Maxikiosco peaked-roof house of colorful panes, framed by Crouscalogero (Estiluz) balloon lights. To get to it though, you must first pass through colorful Pox balls by LMNOQ extruding from the walls and a rubber band stairwell installation by Margarita Mileva. Upstairs is a “Victorian” dollhouse by Snøhetta. In the Nature room, a forest of upside-down hanging trees by Ovando floral design is set against a tropical bird mural by Pablo Piatti for Tres Tintas Barcelona. Alex Gil of Spacecutter has created the “Monolith” dining table circled by chairs that create a solid box when they are pushed into place, as if a virtual tomb. Assorted cutlery in ceramic and in metal by Melissa Gamwell combine conventional shapes and unorthodox shapes, including hammerheads. Mark Talbot’s “Tile Fungus” forms a living cityscape in white bas relief. A highlight of the Future is upstairs in a virtual bedroom by Pryor Callaway. Here, mannequins and beams of laser light make you wonder if sleep will even be possible when you move into your apartment at The Madison Jackson. More cave-itecture under the High Line. Architecture firm Leong Leong and fashion designer Siki Im have teamed up for the fifth and final installation in the Building Fashion series of pop-up collaborations beneath Chelsea’s High Line Park. Picking up where Snarkitecture and Richard Chai left off, Leong Leong has turned the former Sales Tin for Neil Denari’s HL23 condos into another amorphous cave-like interior—only now you’ll have to take off your shoes before entering. “We wanted to radically transform the interior,” explained principal Chris Leong. 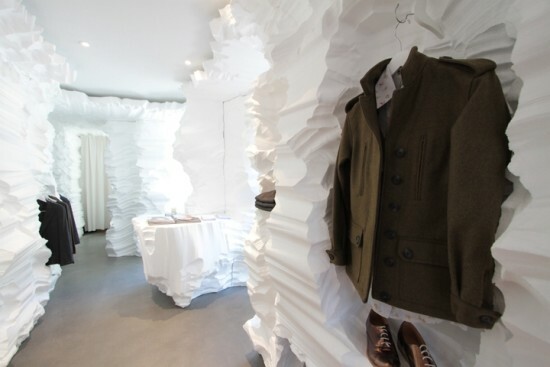 “We wanted to breakdown the traditional pop-up experience.” To do this, the firm oriented the store around a parabolic, foam-covered ramp and hung clothes seemingly at random from the walls and ceiling, which were sculpted with the same soy-based spray-foam. Leong Leong, a winner of the AIA’s 2010 New Practices New York Competition, is no stranger to the fashion world. The New York firm has designed stores for Phillip Lim and Opening Ceremony in New York, Los Angeles and Seoul. The Siki Im pop-up is located at 504 West 24th Street and will remain open through November 15. More photos available from BOFFO. Lurking under the High Line has been a bit more fun since Building Fashion began its series of architecture-and-fashion installations in September, erecting a new collaboration every two weeks as a means of reusing the former onsite Sales Tin of Neil Denari's HL23 condos. On Thursday, Brooklyn firm Snarkitecture and fashion designer Richard Chai will unveil the fourth project in the series, a cave carved by hand from architectural foam. 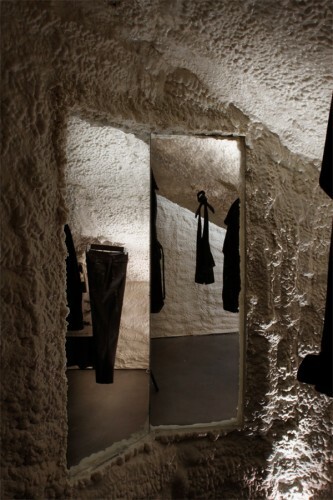 Designed to give shoppers the feel of a glacial cavern, the pop-up shop will feature men's and women's fashions displayed on shelves, niches, and hang bars embedded in the foam. Located at 504 West 24th Street, the store will be open to the public October 21-31 from noon to 6 p.m. The final installation in the Building Fashion series, a collaboration between Siki Im and architecture firm Leong Leong, will be launched November 5, with the adjacent garden designed by Konyk Architecture open through the end of the series.